The Friday before Memorial Day weekend... will anyone even be listening? One can only hope. As we all begin to prepare our summer faces... As we feel the first flush of sun on our pale and lifeless limbs... As we reach out to friends we haven't seen all year as our kids have been too consumed with school, pre- or otherwise... Let us give thanks for the summer vacation. The first major vacation I ever took sans my family where I went alone and paid for the whole thing myself was a trip to England/Ireland and France in the mid-90s, taking advantage of a $200 RT special Virgin was running. I met my cousin there while atop one of the lions in Trafalgar Square, and he instantly became my favorite person ever. Because of this meeting, I fell forever in love with London. 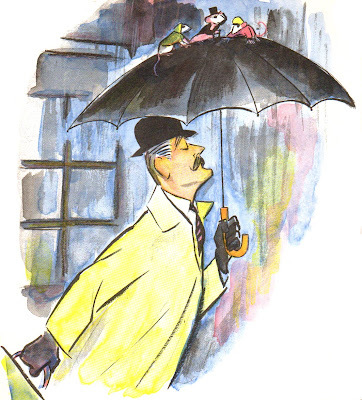 Very much like Freeman's ode to San Francisco, The Guard Mouse is a must-read story for any child going to the city for the first time. 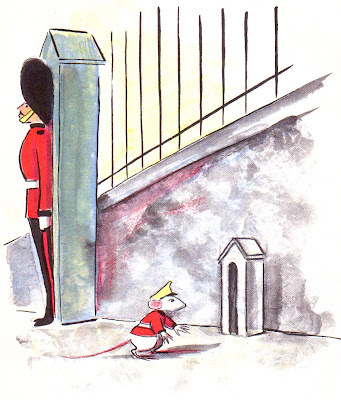 Though it is seemly a story about a little mouse who works as a Grenadier Guard at Buckingham Palace, the book is really a love letter of place. When the mouse gets a surprise visit from distant cousins, it is up to him to show them the sites... from a double decker bus to the hands of big Ben... Leaping from one umbrella to another, they traveled all the way down Whitehall to where Big Ben stands. "That's the most famous clock in the world," remarked Clyde. "It's a stiff climb up, but we can do it." This book tickles me to no end, but I imagine it's gonna get packed up here soon and shipped off to that favorite cousin in New York who just had a baby of his own last year. Mice cousins meeting for the first time in London, almost seems too good to be true. Almost. This is one that slipped past my radar - I'll have to see if I can check it out from the library. Love the artwork. I love the wash of watercolor (as rain?) in the first image. Really beautiful. Haven't been to England, someday! Although, LOVED Ireland! I love the picture with the British man w/ umbrella. I can almost hear the accent! Cute book. 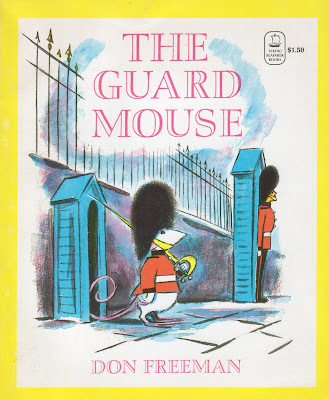 Hmm, reminds me of Don Freeman's other mouse book: "Norman the Doorman" (A doormouse for a museum who is an artist at heart and in his spare time). I'll have to find this one too! i am now off in search of cyrano the crow.... will trade blood for books. I have this book signed by the author with a little doodle of the mouses face and big hat. It is dated 1969. Thirty plus illustrations. What should I do with this book? We've already made /are in the process of making the App version of many of Don Freeman's lesser-known (but still AMAZING) works. Please check us out at www.auryn.com to see all of our titles!